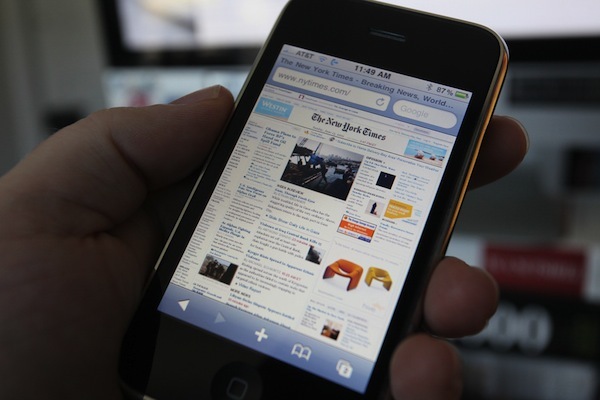 Sound mobile design is crucial for online newspapers. It appears that the approach used by many news publishers when optimising for mobile is simply to scale down their news site and make it responsive. But, this approach won’t get any mobile newspaper foster a sticky relationship with its users. If your news site has already been optimised for mobile but still isn’t performing at the level you expect, you need to examine your readers’ habits and evaluate the importance of mobile access for their day-to-day content consumption rather than just scaling down your news site. In the interest of a better mobile newspaper, Sam Wendel of Vardot touches on what “optimising” really means and what every news organization should think about when doing so for mobile presence. The distinction between a mobile app and a mobile-optimized website can be confusing—and a news outlet should think carefully whether or not it needs a news app (a downloadable software application developed specifically for use on smartphones and tablets, rather than desktop or laptop computers) or a mobile website (a site designed to be responsive across different devices when accessed from a browser). And when I say think “carefully” about a news app, I don’t mean as a necessity, but as in whether or not you should prioritize it right away. To be clear: mobile news app are becoming increasingly popular, and are valubale resource for readers. But if you’re a small newspaper or magazine just making the leap into mobile, or a niche-digital news outlet attempting to scale-up, a news app isn’t going to guarantee you a large user base. The key aspect that all news outlets contemplating their mobile presence need to understand is user habits—and heading to a news app is the destination of choice for some news consumers, but not most. People don’t read the news the same way they play Candycrush or surf Instagram. People are loyal to Candycrush or Instragram when it comes to gaming or photosharing—but they don’t necessarily go to, say for example, Al Jazeera’s news app with the same loyalty; some do, many don’t. They’re more likely to land on one of Al Jazeera’s mobile-optimized websites. This is because reader loyalty to specific news outlets hasn’t translated to the web in the way it was with print news, especially amongst younger generations. Simply put, unlike my father and mother, I don’t wake up each day and sip a cup of coffee in the soft-morning light while I browse the headlines of the daily newspaper. I guzzle coffee and swipe through my Twitter feed as I rush to work—and if a headline or a link posted by a friend catches my eye, I click through. The name of the publication has little to do with it. Mobile news apps can be a valuable tool—but if you don’t yet have a mobile-optimized website or it isn’t producing the desired results, then a mobile news app isn’t going to help you that much. You need to finely tune your mobile website first, because people have changed their news reading habits. Many people only stumble upon a news site because they clicked on a link someone shared on Facebook or Twitter, or through an emailed link, or an RSS feed, or the related content at the end of an article. News publications need a mobile website that accounts for this, because a sizable chunk of traffic is coming from people using their phones under the table during a boring staff meeting or as they stand in line at Starbucks. It’s going to come externally. And this is a major mistake a news outlet can make: assuming most online traffic comes through a homepage or an app that someone has sought out independently. They think optimizing for mobile means migrating the visual aesthetic of a print edition to the web is essential and they put undue emphasis on cramming as much content into the homepage as possible because they think this is the landing page readers want. Having highly-personalized branding and loads of content on the homepage is irrelevant for most mobile users if they’re landing on individual pages via other sites. I myself have clicked on articles with engaging headlines and read the entire piece before doing any investigation as to what the publication was (this might backfire at times; see: The Onion). So if a sizable number of mobile readers aren’t using news apps and are landing on a news site by external means, that means that 1) Good mobile optimization strategy goes hand in hand with good social media optimization, and 2) That good mobile optimization prioritizes how an individual page loads and displays. And mobile optimization is utterly useless if the content doesn’t load correctly or readers find themselves swiping outward on their touchscreen in opposite directions with their thumb and forefinger because the display is too small. So to be a digital news outlet that is not only mobile, but optimized for mobile, the manner in which many readers are going to find their news (externally) and what they’re going to see first ( a content page on a mobile website, not app) needs to be accounted for. But it’s not as simple as that. And this frustration, and the corresponding bounce rate it will lead to, is simply something a news outlet cannot afford—especially a small publication with a margin finer than a sheet of graphene. This means that when optimizing for mobile the right way, thought needs to be given to which content management system (CMS) is best suited for creating a site that will function across a wide-range devices; a basic CMS will work for only the most basic mobile optimization, but a CMS that’s been designed mobile first—like Drupal 8—will give a news platform a better chance to succeed. People aren’t reading news the same way they used to, and the news industry has struggled to come to grips with this. Mobile optimization is now being embraced by media outlets everywhere, but many are making the mistake of assuming it’s a quick fix. It’s not. There’s a right and wrong way to do it—and it’s a debate that needs more discussion. Read full and original article on VARDOT. The right mobile design for this digital age boils down to stretching yourself to think out of the box, considering your users and leveraging data for a better mobile experience. Realview helps news organizations make informed decisions about why and how to utilize today’s digital platforms. Keep reading to learn how Realview creates value and join our multitude of clients who turn the page from their traditional newspaper format and evolve into a modern medium to stand out!